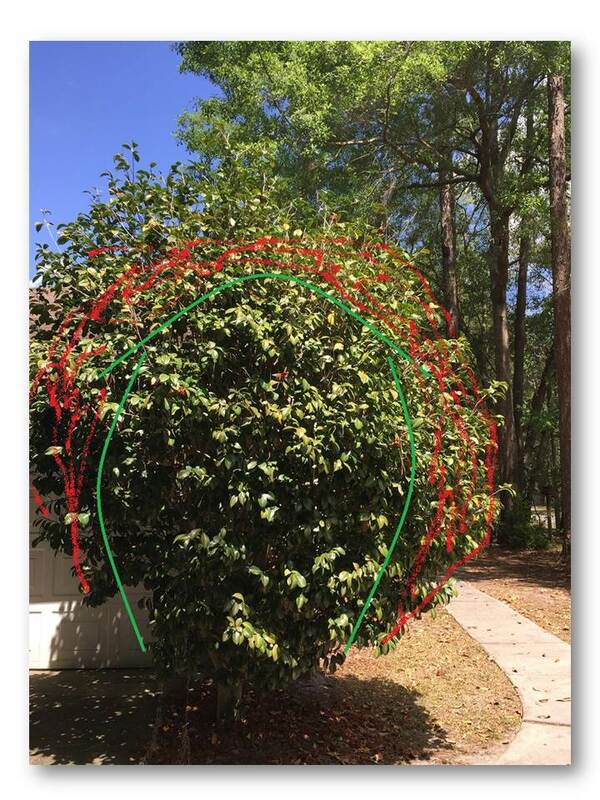 "How I should prune my 14 years old camellia?" First and foremost, that's a lovely Camellia you have there Pati. And I have to tell you, I just love it when people ask the "How should I prune my (plant)...?" question. Because it allows me to come back with a question too ;) my Q is always: why do you want to prune it? What would you like to achieve? The fact is, that any kind of pruning will deliver all of the above. So before we dive into your camellia, let me give you some general information on pruning camellias. For renewal, resizing, and trimming prune during spring. For maintenance pruning - removal of dead branches, density dilution etc. prune from spring until mid-fall. Short diagnoses - considering the size and location of your camellia, if I had to choose, I would only prune to reduce the size of its canopy, nothing else. First - it looks like your camellia it situated in a strategic position next to the house and a path leading somewhere... it is beautifully ornamental and I wouldn't change that. Third, and most rewarding - pruning will enable new growth, new bloom and a new look. If you excuse my drawing skills, and use the marked up image as a guide you will get all three goals. And as I always say, don't try trimming exactly as I marked (follow the green line. The red lines are to be pruned off). it's just a general guideline. A few inches more or less won't make a difference. Note: You font have to remove everything I marked, you can just reduce the height on top. As I mentioned earlier, that is what I would do. And you can play with it as you prune, just step back in-between pruning stages, have a good look and decide whether you want to keep cutting, or if you're happy with the result so far. If you are, stop. 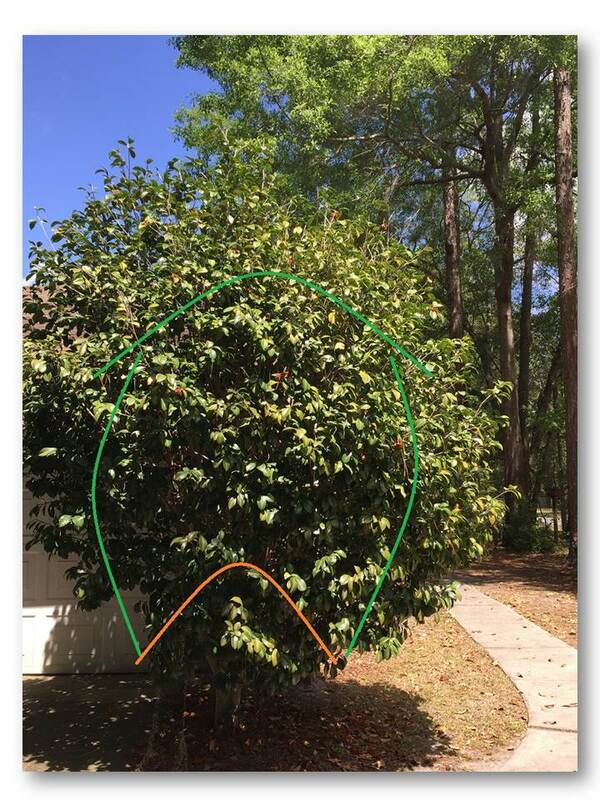 If you prune and remove the lower branches (just under the marked orange line), you'll get a tree-like shape. Just be sure to prune those lower branches as close as you can to the main trunk. 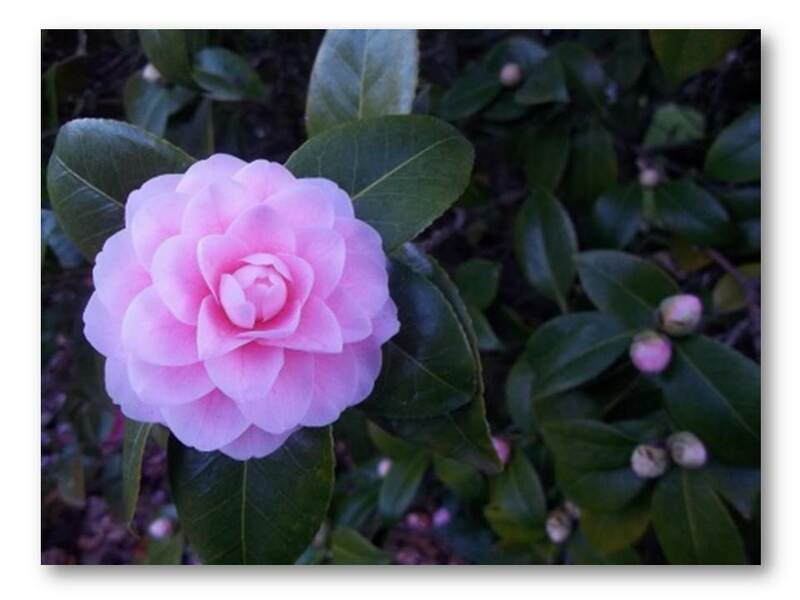 Finally, stand back and examine your work - you will have achieved all of your pruning camellia goals in one new style! After you have finished pruning will be a great chance to look for dead branches hidden inside the shrub.Find and remove them. After your done, wet the soil under the camellia, and as soon as you feel that you can cultivate please do - add some slow release fertilizer (like Osmocot). A slow release fertilizer will make your shrub very happy! If you have found my page on pruning camellias helpful, I would love to see a picture of your camellias new look - we can add it to the page and show others what can be done.